Accent spaces with creative seating provided by the 4' and 6' Backless Cantilever Park Bench. Its innovative 'T' styled cantilever frame and diamond pattern bench creates an eye-catching aesthetic while delivering superior load bearing capabilities. Constructed with large 2-3/8"O.D. 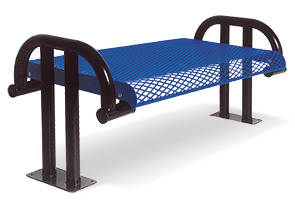 round steel tubing, MIG welded and finished in a corrosion resistant powder-coating, this cantilever bench frame is able to withstand the elements and high volume traffic. Convenient and adaptable, the flat Backless Cantilever Bench provides adequate two-way seating and is able to expand when seating demands increase with 4' and 6' add-on lengths.